Adding to our “melt-up” commentary from the last update, this is an appropriate time to look back at the financial history books. Remember, those who fail to heed the lessons (warnings) of the past, are likely to repeat them. For this update, we’ll look at the market’s reaction to previous tax cuts under various presidents as well as periods of extreme bullish sentiment and finish with a lesson on fallout from protectionism. Regular readers may recall my painful walk through an economics lesson on tax reform and whether or not it would be good for the economy. That update is HERE. In short, the type of tax reform that did finally pass Congress was the bad type, the type that just gives some quick rocket fuel to stock prices and corporate earnings. Many in the financial media are talking up how tax reform will boost the economy without offering much logic other than pointing to the stock market which admittedly is now pricing in about 13% earnings growth in the likes of the S&P 500. That might be the case. But will the tax reform act truly give a boost to the economy, to Main street and the welfare of our general population? I’m going to stick to my guns and say no, not in the end. I won’t reiterate why because I already challenged your attention span with the previous update. But I will give you a real-time example of what I’m talking about. Did you hear what Walmart decided to do in response to the tax reform? Or at least using that as the excuse? They announced that they are going to raise the starting wages to $11/hour and give “some” workers one-time bonuses that could be “as high as” $1000. Babysitters make $12/ hour now mind you. The promises and announcement were vague with a total package cost of approximately $700 Million give or take a $100 Million. And then quietly, they also announced that they were closing 63 Sam’s Club Retail stores. We know that Walmart will save a net $2 Billion in taxes with the tax reform and I’ll bet their earnings do quite well net of unprofitable store closures even factoring in the increase in wages. So, in the end, are Walmart/ Sam’s Club employees better off? Absolutely, if you aren’t among the many hundreds who just lost their jobs. This example is nearly perfect in showing how tax reform will be good for earnings and ultimately bad for main street. Now back to the history books. Investech did a great research project on the financial market’s reaction to past tax reform, both increases and decreases in Federal tax rates under different presidents. Honestly, we shouldn’t draw a straight line of causality between tax policy and the markets because it’s much more complex than that. But the important thing to note is this. 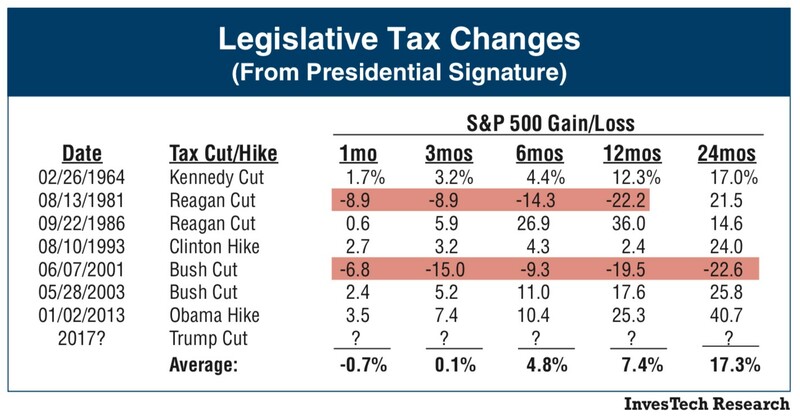 Tax cuts, especially in the first term of a new Republican president, have in fact yielded negative results in nearly all periods following the passage of the act. Those periods are highlighted in Red above. Not shown in the data is the October crash in 1987 of -22% which is just outside the 12-month mark of Reagan’s second tax cut. From a pure market perspective, as counterintuitive as it seems, tax HIKES have been better for stocks in the months and years that follow. Logically, the markets ultimately follow the state of the economy by way of earnings. So, while today’s short-term thrust in earnings is showing up in stock prices, we’re not likely to see a commensurate thrust in the US economy. Wealth inequality will be wider than ever in the next 12-24 months. Heed the lessons of the past and set expectation appropriately as we test the theory behind tax reform again. Sentiment among investors is really a blunt indicator. Regularly, the bullish and bearish figures don’t offer us much of a useful tool in helping direct our net exposure or any other portfolio decisions. That is until they hit notable extremes on either side. I’ve said many times, that we’ll give this bull market the benefit of the doubt until everyone becomes convinced that prices are going higher. 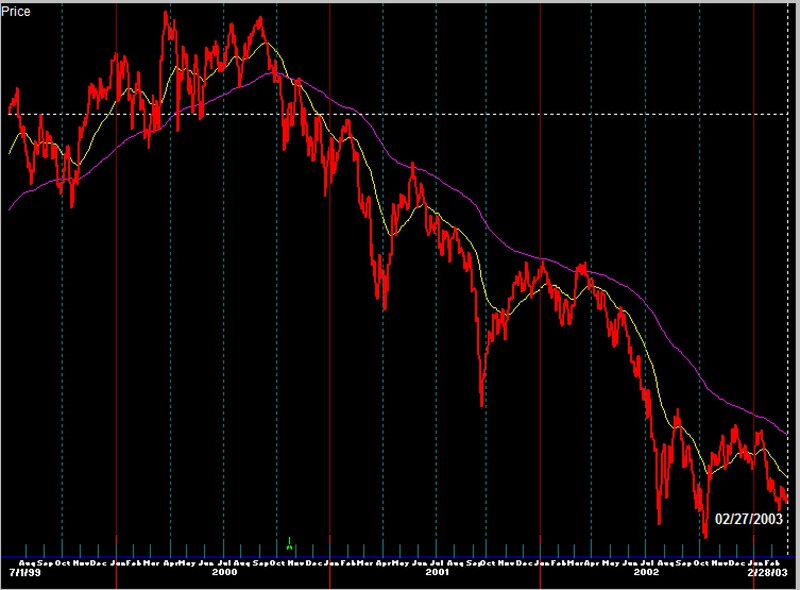 Then we’ll start to get nervous, raise stops and prepare for the next serious decline. In the last two weeks, according to Bespoke Research, we have seen the Average Bullish Sentiment spike to an extreme reading over 60%. Here’s the chart dating back to the late 80’s. There have been only three other times in history when the average of all sentiment surveys hit this very high level. 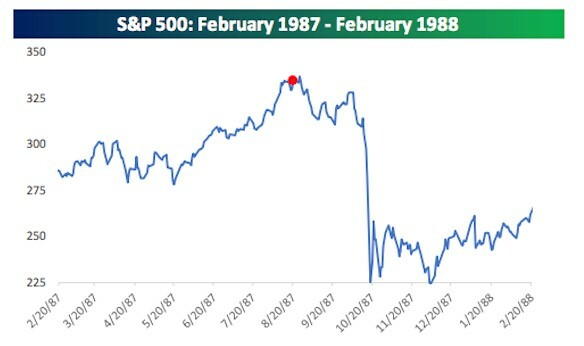 The first was in the month prior to the 1987 crash, marked with the red dot. We don’t want to think about that as a possibility but it happened. 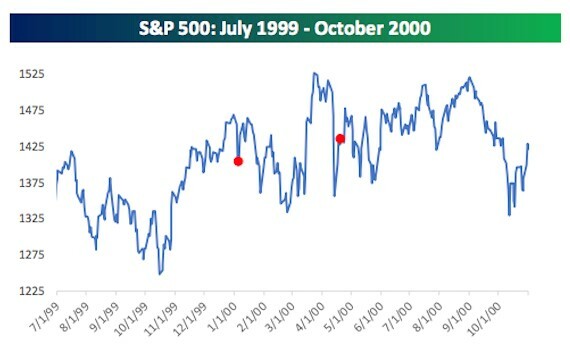 The second was July of 1999 during the most notable melt up in the history of the stock market which I wrote about last week. The bull market ended seven months later in March of 2000 leading to a 24-month bear market of -48%. Here’s what that looks like. 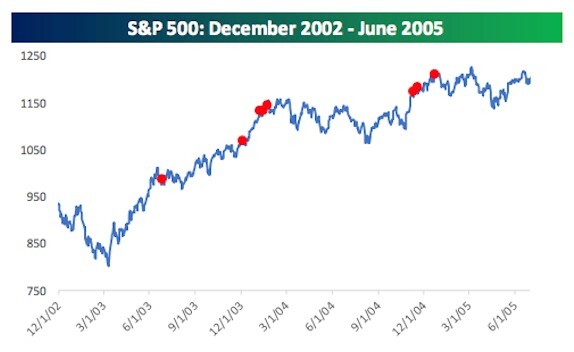 The third set of bullish extremes was seen coming out of the 2003 bear market lows strangely and stock prices pushed higher for several more years! This situation was different in my mind. I was there, managing money and I remember a great feeling of relief (bullishness) that developed as investors realized that the worst bear market in modern history, was over. So, the extreme in bullishness during this time didn’t really match up with the other more dangerous type of bullishness that appears AFTER nearly 8 years of rising prices. Euphoria is not relief and the former is more of a technical warning shot than the latter. And here we are today… making history. Trump is all about America First. From the economic perspective, we see this as an entire package of protectionism. Of course, this is a hotly debated topic covering everything from our participation in the UN, to our relationship with trading partners, efforts to encourage US manufacturing and consumption while building walls and barriers to interaction with the virtually the rest of the world including immigration issues and labor force legitimacy. It’s a big hot mess. The history of American protectionism dates all the way back to the late 1700s with Hamilton driving the first public efforts. There have been other presidents and champions of protectionism especially during cycles of low wages in the US. The common lesson we should learn and understand from previous episodes is the constant of inflation. Inflation is a tax on every citizens’ basic costs of living. Economics students understand the principle of Most Favored Nation which argues that any country who can supply goods or resources to the rest of the world for the lowest cost or efficiency should do so through free trade, effectively providing a constant competitive landscape that keeps costs of living low for all. Protectionism essentially puts an end to that global efficiency by erecting walls, adding tariffs to imports, forcing low-cost labor out of the country. Protectionism has always lead to high inflation and subsequently a lower standard of living for the working class in our country. That is the lesson from the history books. Last night Trump imposed a 30% tariff on all imports of solar panels from Asia, mostly China. I haven’t read the story yet but I think there is also a new tariff on specific imports of durable goods like washing machines (from LG) and even technology (from Samsung). I need to confirm that. Wow! Get ready for inflation as tariff wars begin for the first time in several decades. As a lifelong student of economics, I can’t say strongly enough how troubling this is. People don’t understand the effect of policy changes like these until they are deep underwater with rising costs of basic necessities and bewildered at how they got there. As a country that imports everything, we can’t magically move to a system of self – sufficient sourcing without an enormous amount of pricing pain first. History will be a brutal teacher again I’m afraid. Wrapping it up, these lessons from history are warnings, clearly. Furthermore, they are happening simultaneously driven largely by the current administration. 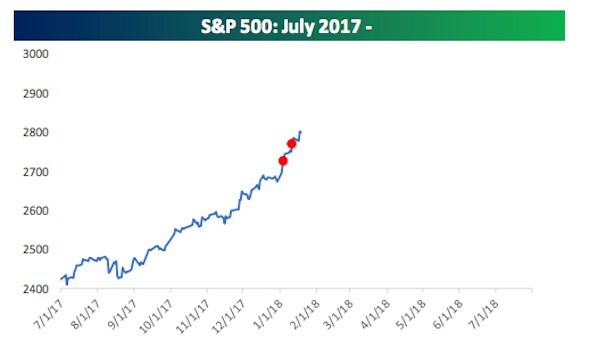 Stock investors are cheering, we’re all making money and that’s great. But we don’t see any of this as sustainable, quite the opposite. Timing is everything now. Needless to say, we’re tightening up our stops on individual positions and the market as a whole. We are also selling just about anything that is underperforming, weak of over-valued to cash. This is as hard as it gets as a manager of investment dollars. We need to stay in the game of a parabolic rise in stock prices while staying true to our risk management discipline. Stay tuned as conditions are changing very rapidly now.